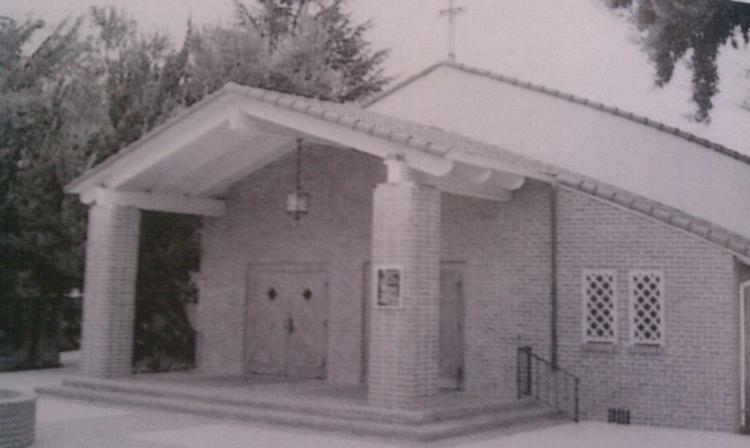 Church of the Presentation of the Blessed Virgin Mary was established in March of 1952 to serve the growing Catholic population in northwest Stockton. Our first Masses were celebrated in the old Five-Mile House, on Pacific Avenue at Rivara Road. One of our early parishioners remembers the altar consisting of a board being supported by two barrels with a sheet over it. It was not until March of the following year that we moved to our current location in what had been an alfalfa patch on Benjamin Holt Drive. It was completed at a cost of $130,000. The first Mass in the church was celebrated on Pentecost Sunday, May 24, 1953. The formal dedication of the church was on February 4, 1954 by the Most Reverend Hugh A. Donohoe, Auxiliary Bishop of San Francisco. Rev. John F. Quinn, our founding Pastor, ensured that the foundation of our parish reflected the teachings and values of the Gospel. This foundation is present today and has lived every Sunday for the past 60 years. Facilities at the time included a convent, parish hall and rectory. In September of 1965, Presentation Parish School opened its doors. Our fine school was under the direction of the Sisters of Charity of the Blessed Virgin Mary who had come from Dubuque, Iowa to teach. This same order had staffed our school well in to the 1990s when lay teachers eventually assumed the instructing and administrative positions. As the Church community outgrew the existing church building, plans were developed for an expansion of the campus as early as the 1980s. However, with a devastating total fire in November 1999, construction plans were changed. A much larger church was built on the original site and dedicated by Bishop Stephen Blaire of Stockton in November of 2001. This development included a Community Center/Gymnasium, multipurpose room, a couple meeting rooms and additional classroom space. With the construction of the church complete, plans for the future of Presentation Parish continued into the final phase, with architects working on plans to redesign the original convent, into a new space for our growing Youth Ministries. The design changes created a more appropriate space for the Religious Education Program, Life Teen and the Extended Day Care/Toddler programs. The Youth Center was rededicated in honor of the Sisters of Charity of the Blessed Virgin Mary on November 18, 2007. The dramatic spiritual growth and fellowship of our Presentation community in the past twenty years has been remarkable. Since the beginning of our Parish Renewal Weekends in 1983, we have seen our parish develop into an enthusiastic, loving and caring Catholic community. Our parish members are also offered new spiritual experiences in Cursillos, Life in the Spirit seminars, Growth in the Spirit seminars, Marriage Enrichment, Engagement Encounter weekends and numerous other retreats. Presentation Church truly offers something for everyone to grow in their relationship with God. Our parish, the Diocese of Stockton, and many other organizations provide opportunities and activities to further our community spirit. Wherever you look, and wherever there is a need our list grows, along with our enthusiasm! The Presentation Ministry Team sincerely thanks everyone who has contributed to the growth of the Parish. We extend a warm welcome to everyone, young and old, new and longtime parishioners to join in Presentation's progress and future growth. We pray that God will continue to bless our parish and the City of Stockton.